"Whatever derivative grey communicates sophistication." You can’t go wrong with grey, particularly when it’s just made for you. In weeks every cloud will have a silver lining when you’re drenched in sophistication. Grey has its place in every season. A versatile choice, it weathers all tempests. Classic and always ready to entertain a range of accessories for a different look every wear. Whatever derivative grey communicates sophistication. Simplistic, but earnest. A slate on which to plan your suit’s first journey, it’s a canvas and you’re about to create art. 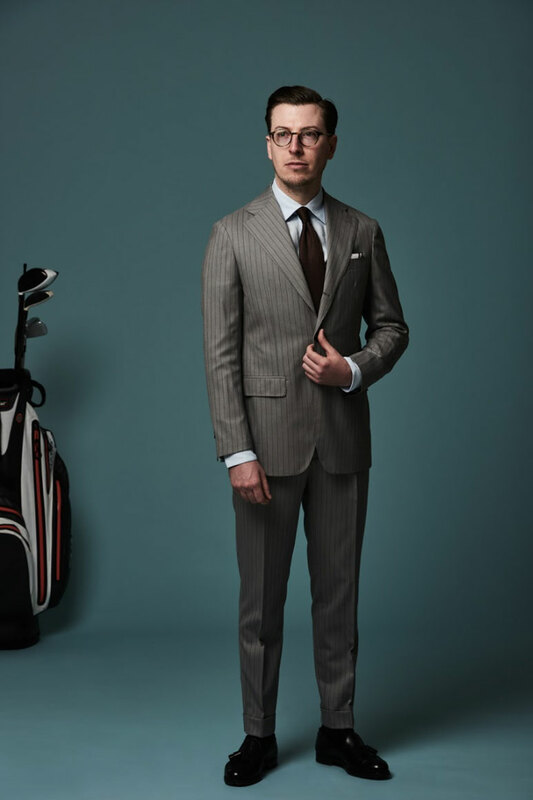 Whether fast-paced or famboyant, there’s a place for a grey suit along every point of the style barometer. It’s adaptable to all preferences and occasions, whatever the trend. The full spectrum of ties at your disposal, no hue unsuitable. Starting with popular black with its Mod styling, to peacock colours opposite, you have choice in your hands from the frst knot. Te simplest way to reinvent yourself each morning whenever you need clarity. Shirts share this versatility. Almost no shade off-limits, neither pattern nor cloth. A regal choice is white with a grey suit, with tailored cuffs and mother-of-pearl buttons. A made-to-measure shirt lifts the tone of the grey, and you become a king. Simple and clean elegance, luxury with restraint when on ceremony, even footwear is cause for celebration as the options increase. Shoe colours can become more adventurous, in classic styles such as monkstraps, derbies or loafers, or even with a driving shoe and knitwear on days off. Don’t overthink it: grey is a failsafe choice no matter what you add to it. When you unzip that navy blue Oscar Hunt suit bag with your pristine tailored suit inside, remember this moment as the one where you life changed. Whenever you wear this made-to-measure you’ll understand when dressing just became easier, and you got exactly what you wanted after all. That’s powerful.